Apple AirPods 2 to arrive in first half of 2019 with 'health monitoring' features? | What Hi-Fi? Apple AirPods 2 to arrive in first half of 2019 with 'health monitoring' features? 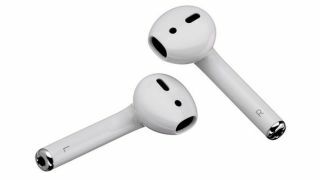 Apple’s next-gen AirPods could arrive in the first half of this year and feature ‘health monitoring functions’, as reported by Digitimes (via 9to5Mac). The rather vague suggestion, mentioned in a larger report on wearable growth for 2019, doesn’t cite any sources or shed light on any other product details, though. Still, while we’ll take the rumour with a pinch of salt then, it has us hopeful that the AirPods 2 will a) arrive sooner rather than later this year, and b) integrate an interesting activity-based tracking feature or two. We do wonder where Apple could go here. Given the minute size of the originals (and their battery), it’s unlikely a heart-rate monitor would be included. And as the Apple Watch features an accelerator for identifying body movement, integrating the same functionality into the AirPods would arguably be pointless, too - or at least, now, anti-climatic. Ultimately, an improvement in sound quality is at the top of our wish list for second-gen variants. The AirPods sound average at best, lacking the detail and dynamic subtlety to truly satisfy. New rumours also suggest that production of the wireless charger (which allows for the simultaneous charging of the iPhone, Watch and AirPods) has now started, a year after Apple first announced it. So perhaps the next AirPods will arrive alongside Apple’s long-awaited AirPower charging mat.